The Saccharomyces cerivisiae mRNA transport protein (Mtr4) is a RNA helicase that interacts with the RNA exosome. The exosome core is responsible for processing and degrading RNA. In vivo function of the core requires several cofactors, on of which is Mtr4. The RNA exosome core is conserved in eukaryotes and Archaea. In both cases the central channel of the exosome is known to be 8-10A wide, or wide enough to process single-stranded RNA. As an RNA helicase, Mtr4 is, in part, responsible for unwinding double stranded mRNA, so that it can be degraded. Mtr4 can act alone to unwind RNA, or it can interact with the Tr4/5-Air1/2-Mtr4 polyadenylation (TRAMP) complexes. This complex consists of a poly(A)polymerase (Tr4/5) and a Zn-knuckle RNA-binding protein (Air1/2). In order to act on its own, Mtr4 requires a 3' overhang of ~5-6 nt. If the RNA substrate does not have this overhang, then it first binds the TRAMP complex until there is a minimal binding site for Mtr4. Mtr4 includes a DExH core formed by two RecA domains, the N terminal beta hairpin, the Winged Helix domain, and the helical bundle domain. The , RecA-1 and RecA-2, bind RNA and ADP. The , packs with the beta strands of RecA-1 and latches on to RecA-2. RecA-2 is connected to the , by 15 residues and the WH domain packs against the . Mtr4 also features the in between the wings of the winged helix. The RecA domains of Mtr4 consist of central beta-sheets surrounded by alpha-helices. This crystal structure shows eight beta sheets in the RecA-1 domain and seven beta sheets in the RecA-2 domain. The cleft between the two RecA domains contains eight conserved motifs that are known to be involved in nucleotide and nucleic acid binding, as well as ATP hydrolysis. The RecA domains are stabilized by the N-terminal beta hairpin on one side and by the helical bundle domain and C-terminal tail on the other side. Conserved, hydrophobic residues in the C-terminus interact with the cleft between RecA-1 and RecA-2. A fourteen residue loop of the winged helix domain extends across RecA-1 in order to connect RecA-2 to the winged helix. The Stalk/Kow insertion domain is a 270 residue insert between the third and fourth helices of the Winged Helix domain. It begins with alpha helices alpha-1 and alpha-2 of the Stalk perpendicular to each other, continues into the KOW (Kyrpides-Ouzounis-Woese) region and finishes with helices alpha-3 and alpha-4, which wrap around the first two alpha helices. The KOW region seems to be a flexible unit, while the flexibility of the Stalk region seems to be restricted by intramolecular contacts at the hinge regions. The arch-like feature of this protein is largely due to a 120 degree turn made in the hinge region, which is likely due to the presence of several conserved residues. facilites the bend, which is stabilized by hydrophobic packing of several conserved residues: Val637, Val643, Tyr646, Leu840, Leu846, and Tyr853. Two invariant residues, Glu640 and Lys856 are near each other due to the sharp bend in the hinge region. The best explanation for the absolute conservation of these two residues is an interaction between the two. It is believed that these residues are oriented in a way that would allow a to form. Like ADP, RNA also binds to the RecA-1/2 cleft. The helicase activity of Mtr4 occurs at the conserved beta-hairpin formed at residues 521-532. In particular, the RNA interacts with Trp524 and Gly526 which unwinds the double stranded RNA. The separation is further aided by electrostatic interactions between Lys 523 and Arg530 and the single stranded RNA. While not the main RNA binding site, it is possible that conformational changes in the affect RNA binding affinity. 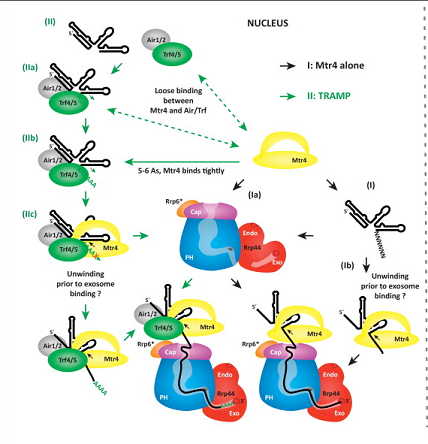 Mtr4 mutants lacking the Stalk/KOW domain have shown reduced RNA binding as well as lower ATPase activity. The Stalk/KOW domain was originally seen as potential TRAMP binding site since both are specific to Mtr4. It also hypothesized that the polyadenylated RNA might be fed to the Mtr4, and thus the TRAMP might be located near the RNA binding site. Nonetheless, mutants of Mtr4 missing the Stalk/KOW domain had similar TRAMP binding as wild-types indicating that the DexH core, again, is the relevant binding site. Further studies identified several key sections of the RecA domains involved in TRAMP binding (Figure credit Falk et al., 2014). The Trf4 Asp122 forms with Arg349 and Asn352 . Trf4 binding is further strengthened by a edge-to-face interaction between Trf4 Phe123 and Mtr4 Tyr339. Air2 has several interactions along the RecA2 domain. Air2 Tyr45 participates in with Mtr4 Ile464, Leu479, and Leu483. Nearby, Air2 Arg44 forms with Glu1021 and a cation-pi with Tyr1020 . Air2 also has a helix secondary structure which forms hydrogen bonds with the Mtr4 helical bundle domain at Lys1015 and hydrophobic interactions with Met1016 .